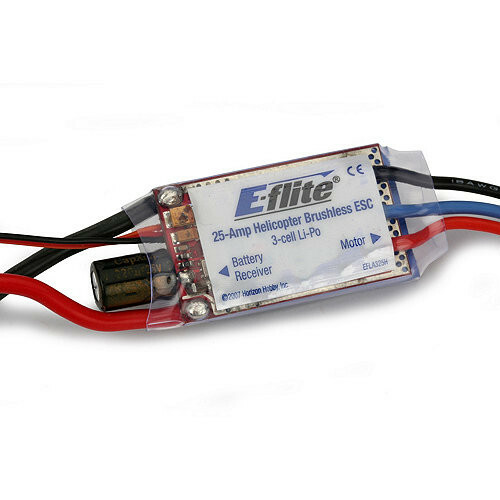 The ESC features a “soft” low voltage cutoff (LVC) that occurs when the battery reaches approximately 9V under load. This helps to prevent “deep” overdischarge of the Li-Po battery during use. Please see the Battery Warnings and Guidelines section for more information regarding the soft LVC feature and how to prevent overdischarge of the Li-Po battery. The soft (slow) start function of the ESC is intended to help prevent potential damage of the geartrain, motor and ESC by softly (slowly) “ramping up” (increasing) power to the motor (particularly when the rotor blades are not already spinning). The first time you “power up” the ESC after it has been powered on and armed, it will take approximately 15 seconds for the ESC/ motor to reach the power level you initially set with the throttle stick/curve. This means you will need to wait approximately 15 seconds before attempting any aggressive maneuvering as you should allow the power system to reach the set level of power first. Any time (after the initial soft startup occurs) the ESC/motor have been powered down completely (to 0% power) for approximately 15 seconds or more, the soft start will occur again. This is particularly helpful if you land the helicopter to make an adjustment as you will not need to re-arm the ESC in order to perform a soft startup. It is simply best to wait approximately 15 seconds before powering up the ESC/motor again for flight. The fast start function of the ESC is intended to allow any level of power to be applied almost immediately after ESC/motor have been powered down completely (to 0% power) for any amount of time less than approximately 15 seconds. This is particularly helpful if you accidentally bump the Throttle Hold switch or when aborting an auto-rotation attempt as it will allow the ESC/motor to reach any power level you have set with the throttle stick/curve almost immediately when the Throttle Hold switch is set back to the OFF (0) position.